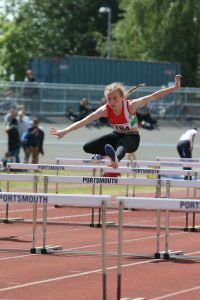 Ella Manning achieved PB's in all 5 events in the Pentathlon at the SE Schools Combined Events on 25 June. Ella came 10th overall in the event after achieving 5 pb's in all 5 events and subsequently a PB in the pentathlon. Apart from the shot the other 4 events were of a good standard. 75mH. 12.6 Shot. 6.99 HJ. 1.44 LJ. 4.64 800m. 2.27.99 Total points 2680 Following her performance Ella has been selected for the National schools Combined Events finals in September.Ella is a first year u15 and only took up the challenge on the Pentathlon some 6/7 months ago. Hard work and enthusiasm has meant she has improved in all events - some by a considerable margin. She is currently ranked 31 in the U.K. under 15 Pentathlon.